This photomicrograph showing mitochondria in a mouse cell is part of an online image database launched today. For many of us, the wonders of cell biology came alive when we peered through a microscope at an amoeba in science class. Today, a new online image library of cells brings that same sense of wonder and magic to anyone with an Internet connection. The library contains more than 1,000 images, videos, and animations of cells from a variety of organisms — from the Chinese hamster (Cricetulus griseus) to humans (Homo sapiens). The database aims to advance research on cellular activity with the ultimate goal of improving human health, according to the American Society for Cell Biology, which has created the database in partnership with Glencoe Software and the Open Microscopy Environment. "In our research of disease, one of the key features is to understand the mechanism of disease — and that is going to happen, in many cases, at the cellular level," David Orloff, manager of The Cell image library, told me. For example, the library will make it possible for scientists to compare different cell types online and understand the nature of specific cells and cellular processes, both normal and abnormal. This may lead to new discoveries about diseases, as well as new targets for drug development. 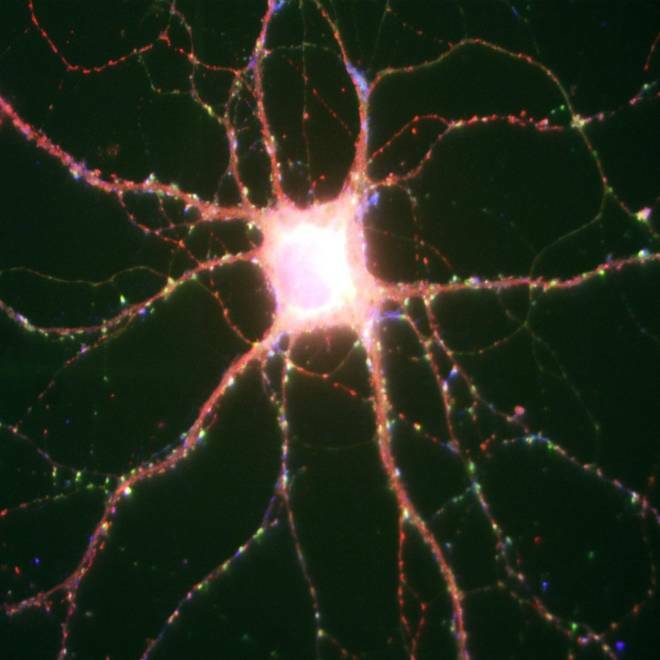 This image of a rat neuron highlights concentrations of a protein called N-cadherin (shown in red) as well as key chemical receptors (shown in green and blue). "By looking at our database of cells, a scientist could get information that can confirm or refute a hypothesis or even develop a new hypothesis," project principal investigator Caroline Kane, a professor emeritus of molecular and cell biology at the University of California at Berkeley, told the journal Clinical and Translational Science. On another level, Orloff told me that the database could serve as a tool to teach the basics of disease: "If someone puts an image of cancer cells dividing [in the library] and you can watch a cancer cell and its division and growth into a tumor versus a normal cell's growth, there's going to be an awareness for the researcher." The database serves as a publicly accessible educational resource for anyone interested in the wonders of cell biology. Think of it as science class without the stress of a pending exam — alhough students may want to study up anyway. "I've talked with a number of teachers who are very excited to have something like this to present in their classrooms," Orloff said. Development of The Cell was funded by a $2.5 million grant made available under the American Recovery and Reinvestment Act of 2009. In other words, this is stimulus money at work "to serve the public in an effort to cure disease ultimately — and advance scientific research," Orloff noted.